As the Roman Catholic church in El Salvador prepares for one of its largest celebrations ever with the canonization of martyred archbishop Oscar Romero on October 14, membership in the Roman church continues to decline in the country. According to polling data from La Prensa Grafica shown above, the percentage of Salvadorans professing to be Roman Catholics has dropped to 41.5% in 2018 from 55.1% in 2004. Meanwhile the number of Salvadorans identifying with evangelical Christianity has climbed from 28.7% to 38.1% of the population, and the percentage professing no religion has now grown to 17.7%. I have always known Salvadorans to be very patriotic with a great love for their country. This love shows up in many ways today, September 15, when El Salvador and the rest of Central America celebrate Independence Day. The day celebrates the independence of the region from colonial Spain. At schools large and small in every part of the country this month, students have been practicing in bands and marching groups to prepare for civic parades. The parades might be big or small, from a parade simply leaving the school and marching through the single street of a small town, to participation in national celebrations at a stadium in San Salvador with helicopters flying overhead and cultural dancers and military bands performing. 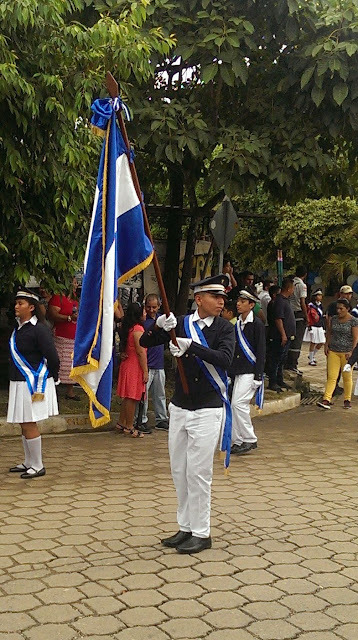 Here are images from one parade, which took place today in the town of Tonacatapeque, northeast of San Salvador. El Salvador's National Assembly remains unable to agree on new magistrates to El Salvador's Supreme Judicial Court. A super-majority vote of members of the Assembly is required, to decide on the magistrates to be named and their appointment to specific chambers of the court. So far, no combination of parties has been able to come up with the required votes for a given slate of judges. Two months have passed since the deadline to name new magistrates to the court. The parties are bargaining back and forth over different names from a list of 30 candidates. The risk of such bargaining is that it can produce judges who see themselves as beholden to one particular party or another. The bargaining does not always (ever?) appear to be focused on which are the most qualified candidates. Former president of El Salvador Antonio ("Tony") Saca was sentenced today to 10 years in prison for corruption pursuant to a plea deal with the country's attorney general. Saca governed the country from 2004-2009 after being elected on the ARENA party ticket and also made an unsuccessful bid for another term as president in 2014. Today's sentence did not come as a surprise. Saca had already confessed and provided the details of the corruption scheme. 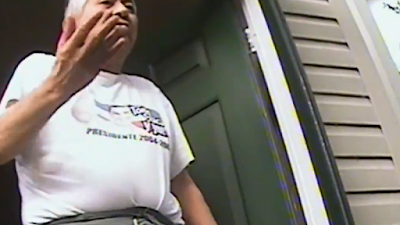 The plead deal and confession allowed Attorney General Douglas Melendez to secure a conviction, something he has had a difficult time doing in high profile cases in the past two years. US consumers may look on tags on their underwear and find that it is "hecho en El Salvador" -- made in El Salvador. El Salvador garment factories have long been a source of underwear for the US market and that trend is continuing. An article on an apparel industry website today notes that HanesBrands is investing to expand its factories in El Salvador where underwear for the US market is sewn: According to an article in Just-Style, the garment manufacturer will invest a total of $10.4 million on its facilities here and increase employment by 430 jobs. HanesBrands decision to increase investment in El Salvador is attributed in the article to a new customs union among Guatemala, Honduras and El Salvador as well as the country's decision to cut diplomatic ties with Taiwan. You can read HanesBrands public relations pieces about its operations in El Salvador here. Every election season in El Salvador I have to laugh. 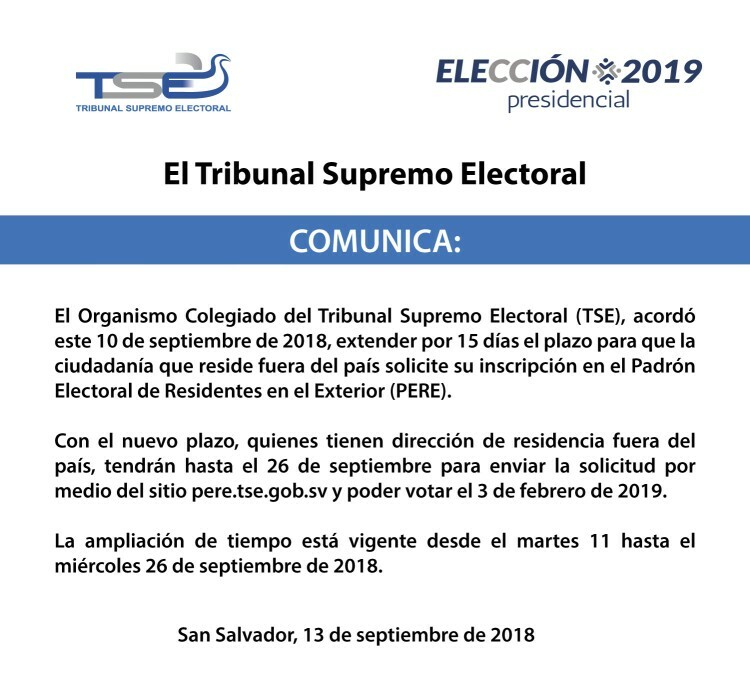 The country's electoral code prohibits campaigning too far in advance of the election date. Candidates cannot campaign more than four months before the presidential election, and no more than two months before the election of legislative deputies and mayors. But this has never stopped anyone as far as I can tell. From Tasajera Island we come to San Bartolo, Ilopongo. People are fed up with division, populism and corruption. I can offer you my experience as a generator of jobs, so that this country will truly change. In January 2018, the Trump administration cancelled Temporary Protected Status (TPS) for almost 200,000 Salvadorans living in the US, effective September 2019. Under TPS, Salvadorans who were in the United States without documentation in February 2001, were able to remain in the country, obtain employment authorization, and live without fear of deportation. The US government granted TPS for Salvadorans and for Haitians following devastating earthquakes in those countries in 2001 and 2010 respectively, and Hondurans after Hurricane Mitch in 1998. After each 18-month period since then during both the Bush and Obama administrations, DHS had reviewed the program, determined that the nationals could not yet return safely to their countries (due to severe safety, health, housing, and infrastructure problems, exacerbated by subsequent natural disasters), and extended the program. A proposed law was introduced in August in El Salvador's National Assembly to provide programs in schools concerning responsible sexuality and self-worth in order to combat the problem of teen pregnancy in the county. The draft law defined the programs' scope as dealing with biological, psychological, social, emotional and ethical issues of sexuality within a framework of human rights, prioritizing the elimination of the culture of violence. El Salvador's legislators quickly tabled the proposed law That was a mistake. The problem of teen (and younger) pregnancy in El Salvador is a serious one. According to the Ministry of Health, between 2013 and 2017, more than 900 girls between the ages of 10 and 17 gave birth each month -- 30 per day. Between 2013 and 2015, one out of every three pregnancies in El Salvador involved an adolescent mother. Three different events from the past month concern the march towards justice in the case of the December 1981 massacre of children, the elderly and others at El Mozote and surrounding communities. First. the ongoing trial against former Salvadoran military commanders continued in August with the testimony of expert witnesses from the world-renowned Argentine forensic anthropology team. Experts Silvana Turner, Mercedes Doretti and Patricia Bernardi provided scientific analysis of the cold facts of the massacre at El Mozote. Recent polling by La Prensa Grafica indicates that Nayib Bukele, as a candidate for the GANA party, leads the race towards the February 2019 presidential elections in El Salvador. These are some of the first major polling results released since Bukele found his way onto the presidential ballot as the candidate of the GANA party. (The preferences are expressed by party rather than candidate, because presidential election ballots in El Salvador involve a choice among party names, not a choice among individually named candidates).